I’ve had a lot of indoor time on my hands this winter. With back to back snowstorms in the Northeast burying us in 5+ ft of snow, accompanied by bitter, bitter cold (do I sound bitter – lol? ), my time outside this season has been mainly dedicated to two activities – snow blow, shovel, repeat. Over and over and over… To combat “cabin fever” I’ve started several creative projects like photographing the development of icicles outside my kitchen window, and cooking. 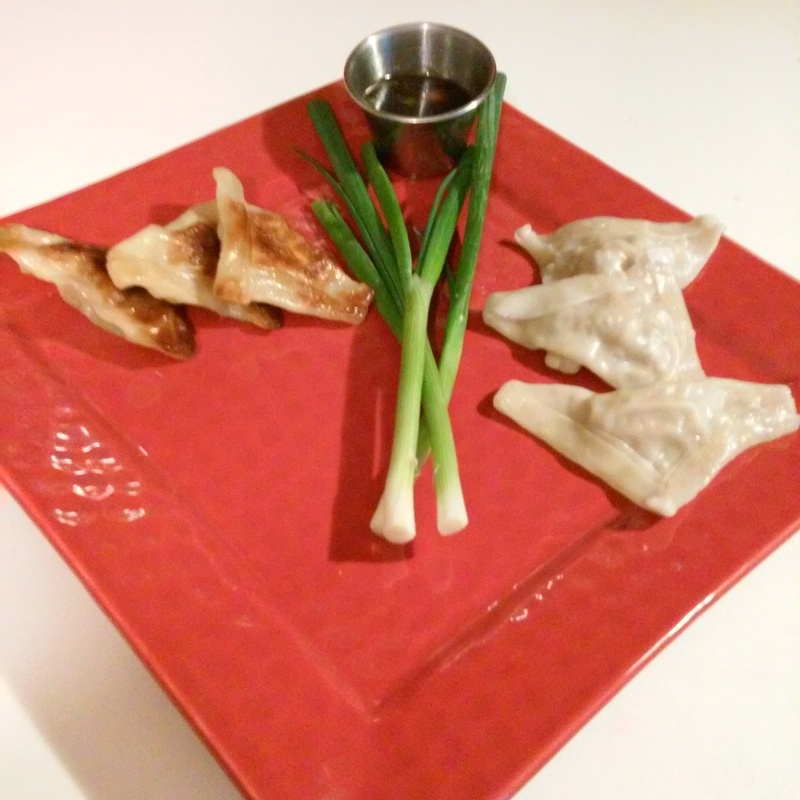 This week’s project is a favorite of mine – Chinese pork dumplings. I love these because they are very versatile – they can be served as a soup, an appetizer or even as part of a meal. They’re a little labor intensive, but so worth it! A single batch will produce five to six dozen, double it, and you’ll have dumplings through Spring! Combine first 11 ingredients, except wonton wrappers. Mix thoroughly. 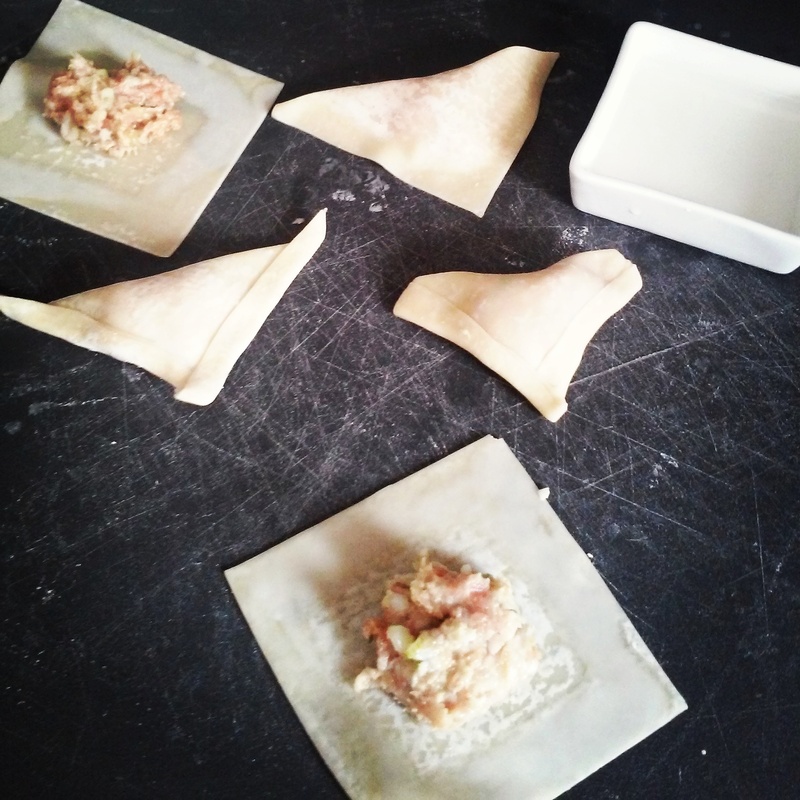 See below for tips on how to fill wonton wrappers. Lay out 5 to 6 wrappers at a time, and I set them up with a corner of the wrapper pointing towards the top of the work space. Using your finger, wet all four sides with the cornstarch water. Using two teaspoons, drop approximately a half a teaspoon of the pork mixture onto the center of the wrapper. Fold the wrapper by pulling the top corner down to bottom corner. Pick up triangle, point side up and hold with both hands using thumbs and forefingers. Start with one open edge, and pinch to close, pushing in around pork ball to get any air pockets out. Pinch other side closed. Moisten pinched edges with cornstarch water and fold over edge and pinch for an extra seal. Bend corners on long flat side back and pinch to seal. See below for cooking instructions. For later use, freeze dumplings on a cookie sheet and then transfer to freezer bags for storage. Directions for dumplings: Bring a pot of water to boil. Add dumplings and boil 6 to 8* minutes until dumplings look a little translucent. Directions for Pot Stickers: Coat the bottom of a skillet with enough oil to cover the bottom. Heat skillet. Add dumplings and cook until bottoms begin to brown. Add water until bottom of pan is covered and water level is half way up the side of the dumpling. Partially cover the skillet allowing a little steam to escape and cook until water is evaporated, approximately 5* minutes. Once water evaporates, continue to cook, uncovered, for an additional minute so that the dumpling bottoms crisp up again. Directions for dumpling soup: Use chicken broth instead of water, and add your favorite seasonings like garlic, soy sauce, ginger, sesame oil, red chili flakes. Add favorite vegetables such as carrot shreds, spinach, Napa cabbage or Bok Choy, peapods, green onion, sliced water chesnuts. *Extra time may be needed if cooking frozen dumplings. Can be refrigerated for later use for approximately a week. This entry was posted in Random Recipes, This & That by C.L. Alden. Bookmark the permalink.